This cake, like me, is in a somewhat Italian mood. It's adjusted from another recipe that in turn was a variation of this Nigella Lawson olive oil cake. 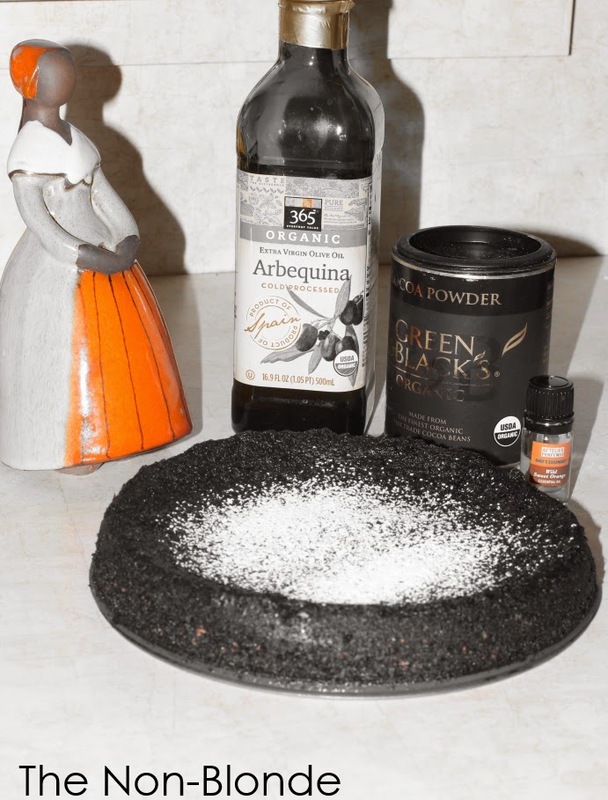 Quantities (and cake size) have been reduced, as was the flavoring: my cake is scented with Aftelier Wild Sweet Orange Chef's Essence (the one in Yellow Mandarin will also be perfect). The cake is light, moist, and fragrant. It's also wheat and dairy free (though not vegan). Of course, it's tempting to serve it with unsweetened whipped cream (which should be a food group, if you ask me), but that would be a distraction from the lovely flavors of this cake, so a light dusting of confectioner's sugar is quite enough. Two notes about the ingredients: use regular non Dutch-processed cocoa, the best and most fragrant you can find (I used Green & Black, but Scharffen Berger is also wonderful). As for the almonds, buy them whole and raw, and grind them yourself in the food processor right before baking (with their skin on). It only takes an extra minute, but ensure freshness and a superior taste. The original recipe is in metric units. I switched my digital kitchen scale to kg/gr for accuracy, and highly recommend doing the same if possible when working from a UK recipe. 130 gr (4 2/3 oz) super-fine sugar. A little more if you have a really sweet tooth. 1. Pre-heat oven to 325 F. Grease and prep an 8 in spring foam pan. 2. Sift the cocoa powder into a bowl, whisk in the boiling water to form a smoothish paste. Set aside to cool. 3. In a separate bowl, combine the ground almonds with the baking soda and a pinch of salt. 4. Whisk together the oil, Essence, sugar and eggs for several minutes until thick and creamy. I used a handheld mixer (a big KitchenAid is far too large for this amount and would be ineffective). 5. Add the cocoa mixture, blend well, and fold in the almond mixture. The batter is quite runny. It's ok.
6. Pour into the pan and bake for about 40 minutes (my oven was done in 35), until the sides are set and have started to pull away from the pan, and the top is springy. 7. Let the cake cool for 10 minutes still in its pan, and then ease it out. Dust with confectioner's sugar. Serve warm or in room temperature. This looks perfect and so timely! I was just wondering what treat to cook today, and up you popped with this excellent recipe. Thank you for the inspiration! Update: I made it and it was really yummy! Very moist and very moreish. I am now a convert to olive oil cake, which I would have thought before I tried it was weird - but now I know better. I'm SO busy today but I can't help commenting. I'm a veterinarian but I'm also pastry trained (I know, it's weird) and I've never come across a better olive oil cake than the one in Pierre Hermé and Dorie Greenspan's *amazing* and seriously underappreciated book titled, Desserts by Pierre Hermé. This Ligurinan lemon cake is beautiful, especially when I use key limes from my back yard and mild but a soulfully nutty Spanish olive oil whose name I can't currently recall (sorry!). Anyone who admires subtle fragrance in their foods should look this one up. It's SO easy. Just *please* skip the raspberries they recommend. Totally uncalled for gilding. Olive oil cakes are one of my top two favorite types of cakes and this one sounds like pure heaven. Can't wait to have the smell of this in our kitchen. Have both of the Aftelier essences, but haven't used the Yellow Mandarin yet, so I think I'll go with that one. Thanks for this recipe! Perfect antidote for obstinate refusal of sun to behave as it should. Wow - this looks great - will definitely try it!